Vanity Plates Sell Like Hot Cakes. Why? I have to confess that I have never really seen the point of personalised plates. It has never once crossed my mind that I could find a sequence of numbers and letters which let the world know who owns my car. I’ve also occasionally idlly wondered whether you can get personalised plates in other countries. I’ve never seen cars with B0BBI3 or B1G J0HN on them anywhere but in the UK. 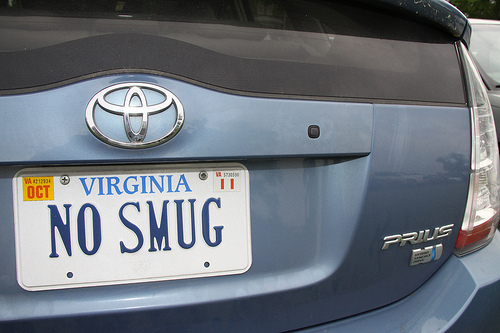 I did a quick search online and the only other places which popped up on my Google were New Zealand and Australia, while in the US they seem to be called vanity plates, which is probably a better name for them if we are being honest. The New Zealand story I came across proved particularly exciting, as it seems the authorities down there are fairly lax with rude names on plates. A cat lover was allowed to use PUSY4U while a young lady managed to get F4NNY on her car after consulting with her friends on what plate her pink VW should have. It seems there are plenty more borderline plates out there in NZ which no one ever complains about, so you know what to look out for next time you are there. It seems as though I am rather alone in thinking they are rather useless though (pushing the boundaries of good taste notwithstanding). There are lots of them sold every year and 2012 has been a bumper year. The Jubilee theme was especially popular in a recent sale at London’s City Hall. HA12 RRY and PR11 NCE inexplicably sold for a total of over £20,000, while someone handed over a perfectly good £2,548 for the Olympic themed RUN 3R. The highest price paid was £454,000, which I personally consider an astonishing amount of money to pay to be able to drive about with a plate which says 80 O. Almost £5 million was raised from the event, but perhaps the most notable outcome is that I am left feeling even more perplexed by the world than ever before. This entry was posted in Musings, News and Views and tagged Aston, Australia, Borderline Bad Taste, car, City Hall, Google, London, LS, New Zealand, NZ, price, RUN, UK, US, VW by Robert Bell. Bookmark the permalink.